The latest machine to roll out of Jendamark’s research and development department is proving the company’s capabilities in building technically demanding and innovative equipment on par with the world’s best. Two years in the making, Jendamark’s new pinion nut tightening machine represents the next step in the company’s ongoing quest to meet and anticipate automotive customers’ assembly requirements. Its essential function: To tighten a nut onto a pinion, which is fitted during the vehicle differential assembly process. Its conceptual challenge: To do so while the pinion is in motion. “Unlike most of our R&D projects, this machine does not address an anticipated requirement but rather an existing one,” says Jendamark design director Yanesh Naidoo. “However, there are only two or three companies in the world that make this kind of machine. We wanted to prove that we could do it as well as, if not better than, our competitors, while adding our unique Jendamark ‘spice’ to the mix. Mechanical design specialist Barto de Koning explains the importance of the pinion nut tightening process during differential assembly. “A pinion is a round gear that is fitted to a differential and constrained by two bearings. Using two motors mounted above each other, our machine tightens the pinion nut onto the pinion, while the latter is turning. The machine has a maximum rotational speed of 65rpm and is designed to tighten differential nuts up to 1400Nm. All drive components are rated to 2000Nm, while tooling changes accommodate different variants. While a pinion nut may sound like a relatively minor part of the assembly process, De Koning says dynamic tightening can have major implications for Jendamark customers. Inconsistent static tightening by other machines means that some differentials may fail, whereas others may not, resulting in a worst-case scenario – the recall of a particular vehicle series. With OEM manufacturers now offering longer vehicle warranties, tier-one suppliers are under increasing pressure to ensure that their components last longer and do not fail with ordinary wear and tear. “This is the way the industry is moving and we need to equip our customers to manage these changes effectively,” says Naidoo. As a result, Jendamark is now receiving requests for quotations for complete assembly lines that include this machine. The prototype has been shipped to a German customer’s production facility in China for installation in July. Jendamark’s rigorous apprenticeship programme contributes to job creation, while building a highly skilled workforce trained to do things “the Jendamark way”. Here two female artisans share their success story. This is the advice of 29-year-old Funeka Solomon, one of the 20 candidates handpicked for Jendamark’s in-house apprenticeship programme since 2012. Now a qualified grinding artisan, Solomon successfully completed the company’s rigorous four-year programme in two-and-a-half years after being subjected to several insubstantial learnerships. Armed with an NQF level four qualification but unable to find the challenge she craved, Solomon finally found what she was looking for when she was recruited by Jendamark. The demanding in-house programme covers the theoretical and practical modules required by the national sector education and training authority for the mechanical, engineering and related trades (Merseta). On completion, candidates are ready to sit their national trade test to become qualified artisans – in mechanical engineering for toolmakers and electrical engineering for electricians. Today, Solomon’s single-minded focus, competency and passion for the job are a far cry from her first encounter with the toolmaking trade. Assuming the mantle of mentor, she now shares the technical and practical guidance she received with the apprentices following in her wake. She says Jendamark’s on-the-job training taught her to raise the bar in terms of performance and precision. Solomon says the secret to success is simply to love the job. Like Solomon, CNC machine operator Nolovuyo Mjuza completed the programme in just two-and-a-half years because of previous exposure to similar, albeit poorly run, learnership programmes. Here she learned to machine to extremely tight tolerances, moving between the milling machine, grinder and lathe, says Mjuza, 30. 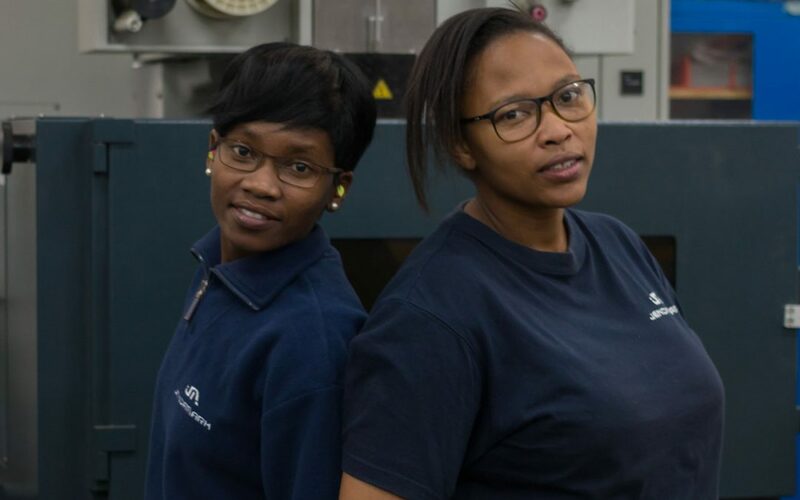 Although she initially studied mechanical engineering, Mjuza left college to take up her first learnership opportunity, as toolmaking sounded like exactly the kind of mental and physical challenge she was seeking. Today, Jendamark has expanded its programme to include toolmakers, electricians, fitters and millwrights. As women in a male-dominated industry, Solomon and Mjuza are holding their own in the toolroom. “The guys treat you like an equal; you’re ‘in’ if you can do the job,” smiles Solomon. Although women’s empowerment plays an important role in the apprenticeship programme, skills development facilitator Marcha van Huyssteen says it’s more about moulding good candidates to become “Jendamark people”. Van Huyssteen says the ideal candidates need to be technically minded and in possession of their N2 diploma. Jendamark’s ISO-certified manufacturing capabilities cover a range of standardised and custom-designed machines for the global automotive industry. Supplying to first and second-tier suppliers supporting the original equipment manufacturers (OEMs) is the basis on which the business is built, with a dual focus on the powertrain and catalytic converter assembly industries. Group manufacturing director Graeme van Zyl says getting into the manufacture and supply of differential assembly lines as part of its powertrain offering has been a particular source of pride. With regard to the catalytic converter industry, Van Zyl says Jendamark’s strategy of consolidating and providing standardised machines has allowed the company to develop rapidly in the global market. “Offering standard solutions is the most technically sound and cost-effective way of doing things,” says Van Zyl. More than a one-size-fits-all approach, he explains, it requires a thorough understanding of the customer’s requirements and the ability to deliver accordingly, regardless of the technical challenges involved. Van Zyl says the difference between a good machine and a really good machine is the tolerances to which they work – the tighter the better. 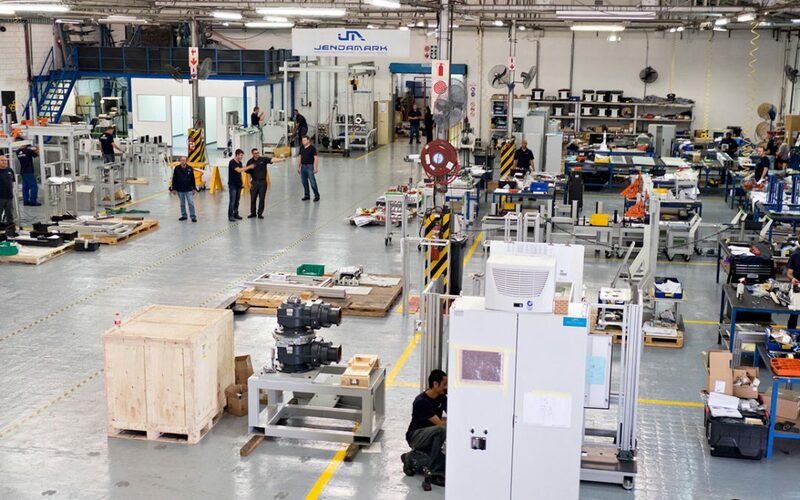 In India, Jendamark Techcellency has earned a reputation for manufacturing exceptional, complex machined parts and is one of the few automation solutions providers to offer high-end in-house manufacturing with stringent quality controls. “You can have the best machines but ultimate quality comes only when every department involved is equally focused on making the best machines for our customers,” says Van Zyl. Total control of the entire manufacturing process – from material purchasing and logistics to the functional commissioning and installation of the equipment – is, he believes, the only way to ensure product quality. Van Zyl says having a precision manufacturing department, in addition to a general manufacturing section, means that more intricate engineering aspects can be handled without compromise. When challenged in the world of micros, he says, establishing a temperature-controlled environment in the machine shop was just one of the essential requirements the company had to meet to achieve the tight specifications. At every step, Jendamark’s CNC milling, wire-cutting and grinding capabilities are closely scrutinised with the aid of accurate measuring equipment. The use of GOM 3D scanner measuring technologies ensures an accurate and well-documented product. 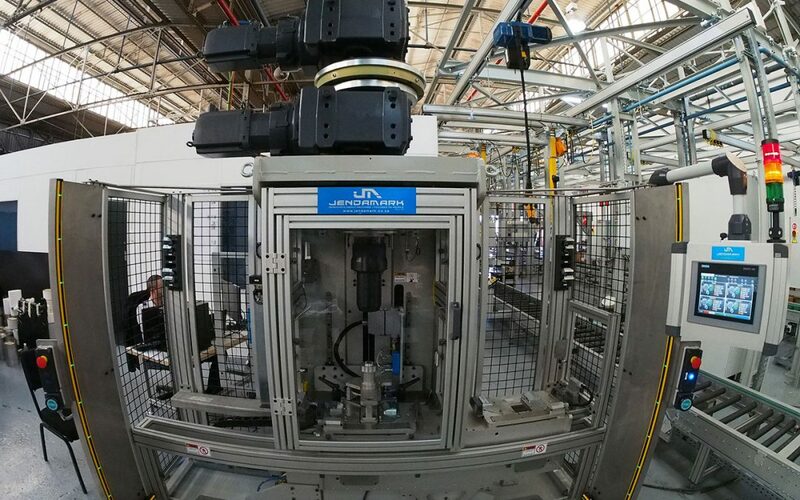 Van Zyl says the tooling is independently assembled and tested in the quality department before being fitted into the machines to check the entire production process. “Each individual component is manufactured and then assembled. It’s the collective quality of those items that starts coming into play to define the outcome of the design,” he explains. Having gone through the processing, manufacturing and assembly departments, the machines are finally put together as a completed production cell in the commissioning hall. “Once the processes are proven and the customer has signed off, the entire facility is disassembled, shipped to their premises, reassembled and recommissioned by our team of engineers,” says Van Zyl. It is not enough to agree on common definitions. For our values to contribute to creating unity and forming the foundation of our company’s culture, we must agree on the behaviors these values require. Welcome to this inaugural edition of Jendamark Junction. “Passionate about machines. Focused on people.” That’s the theme around which everything in the Jendamark Group revolves and, on a global scale, the automation industry too!